Here is the write up about the 24-Hour run I put on for FUN, as well as a fund-raiser for Relentless. However, no photos are found on THIS page because I’d have to go back through and re-load all the photos again here, which I won’t do in the interest of time and saving consternation. I encourage you to click on over to the page on Relentless where I’ve posted the full deal. The event was truly special for everyone and we all did have fun! It was a lot of work but so worth it in the end! I’m so grateful for all your thoughts and prayers and for all the help by volunteers here! I’m also very grateful for all the donations that came in for Relentless! Again, I’d like to encourage all of you who follow this blog to also follow the blog on Relentless, as well as the Facebook page to keep up with what I’m doing. 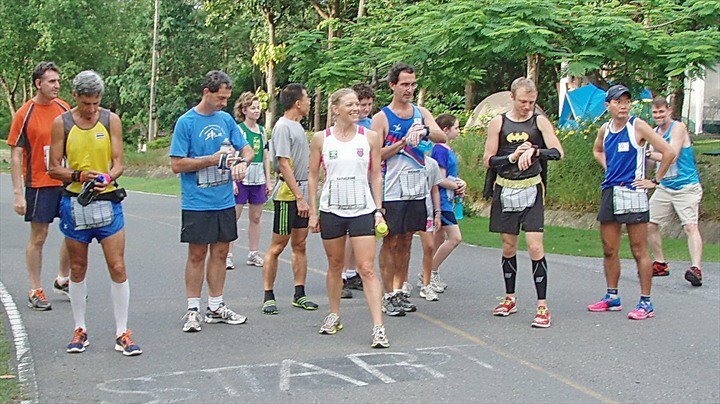 On 25 May at 2pm, the first wave of runners started off the line for the Second Annual Relentless Chiang Mai 24 Hour Endurance Run. It was quite an international group, with twelve different nationalities represented among the 42 participants. Even so, ultramarathon culture transcends all others as the main aid station along the looped course became a home away from home – even as the many expatriates already call Thailand a home away from home. Located near Chiang Mai in Northern Thailand, Huay Tung Tao Lake is encircled by a 3.7 km, nicely paved asphalt loop. The gently rolling road provides just enough diversity to keep the muscles interested, and there is enough shade to keep runners cool for much of the way. After the swimmers, picnickers and fishermen packed up for the night, the full moon came out so that nobody needed to wear a headlamp. Crickets and frogs joined the chorus. Magical. Runners had the option of running 6 or 12 hours, and four teens participated in the 3-hour kids’ division! A relay option for teams of up to eight people was offered for the 24-hour time, but nobody took advantage of that – everyone wanted to go hard-core solo! Another unique feature was that the 3-, 6-, and 12-hour runners had the option of starting at either 2pm, 6pm, or 10pm. Some of the participants wanted to start earlier and get their run in, while others cherished running through the night. This timing also helped to spread out the runners and give the 24-hour people more company through the night. This event pulled the absolute best from everyone. It was never about “winning” to beat another person – as there were no prizes for 1st, 2nd, or 3rd. It was all about challenging oneself – an opportunity to push further than previously attempted. The top 12-hour finisher had never run further than 55 km before his remarkable 85 km distance! Nearly all of the runners set a personal record, either in the most distance ever covered or the fastest time it took to cover a certain distance. Most set personal records of over 20-30 km. A timed event, unlike a distance-oriented event, gives participants the opportunity, when they are tired, to take a break. They eat something, drink some coffee, stretch, and re-evaluate. Then they are ready to head back out for more. It was a safe environment in which to push themselves further than they thought possible. It was exciting to be a part of an event in which so many people came away having bettered themselves and achieved something great. The aid station crew was no less exceptional. Many friends and relatives of runners volunteered their services and helped crew everyone – not just “their guy.” The kids who ran the 3 hours also stayed up most of the night and were the most cheerful and helpful crew ever! Several volunteers (including the kids) took laps with runners they had met only a few hours prior to keep them company and encourage them along the way. This was most helpful during the hot, middle part of the second day when we were all flagging a bit. Finally, another remarkable note about this event is that it was a fundraiser for Relentless, a project that fights human trafficking through health care. Although this was a small event, approximately $8000 was raised, over $3000 of that by a single participant! I look forward to hosting this event again next year and I hope that those of you who may be traveling through Southeast Asia looking for an ultramarathon will consider joining us next year! Categories: adventure and sport, Relentless, Thailand | Tags: Chiang Mai, Chiang Mai Ultrarunners Group, expat life, fund-raising, Relentless, running, Thailand, timed event, ultramarathon | Permalink. I’ve been quite busy these last couple of months in the States, so today I get a 2-for-1 on the blogging about this important issue. Here is what I’ve just posted on the Relentless site. If you get both, no need to read this one. November is Orphan Awareness month. You will no doubt see many posts by friends about orphans, adoption, fostering, etc. There are many perspectives on this topic but I will present just one here – one related to the just care of these vulnerable children. First, a clarification: many “orphans” around the world aren’t technically orphans at all. They are children who have been abandoned for one reason or another. Sometimes the children have a disability and the parents either do not want to have a disabled child, or are overwhelmed with the burden of caring for the child. Sometimes divorce, poverty, imprisonment and other factors contribute to the child’s abandonment. I’m not demonizing these parents, I’m just stating what is true in many places. A colleague of mine who works in a children’s home had a trusted friend in her church invite her to bring the children to a fun day of activities with other children. When they arrived, all the children were separated and placed in 20 different vans with tourists from different parts of the world. The children’s home staff were not allowed to be with the children. 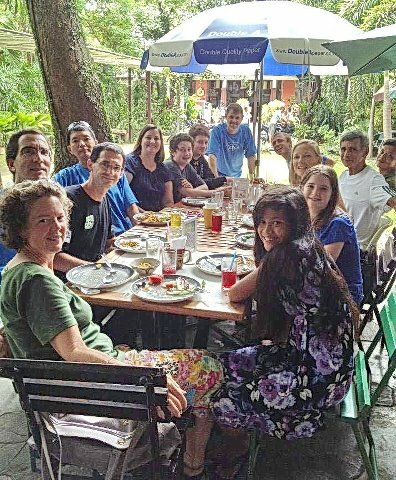 This was a group of tourists who had paid a lot of money to the leader of this group to allow them to spend a day with children at an elephant show, etc. However, since my colleague and the staff could not accompany the children, she demanded that the children be returned to her and they went back home. The leader of the tour group was angry. Some of the leaders of other children’s homes and the tourists were upset, and did not understand. Some of the other leaders wanted to know why the children in my colleague’s group kept covering their faces when people were taking photos of them. Well done, kids! Nothing bad happened, and nothing bad was intended, but the procedure of the “fun day” presented all kinds of risks to the children. Children have a right to privacy, even if they are “wards of the State” and their care is funded by foundations based in foreign countries. Children also have a right to be protected. Some well-intentioned volunteers can inflict unintentional harm on children. Some volunteers appear to be well-intentioned but have nothing but harm intended for children. Proper child protection policies properly enforced will protect children, as well as protect those serving children. You will find much more information about why children are not tourist attractions at the Child Safe Network. Here are some Child Safe Traveler Tips. You will be interested to see this documentary on “Cambodia’s Orphan Business“. Do you have any other reflections or questions or comments about this? Perhaps you have a story to share – please do! Categories: orphan care, trafficking | Tags: orphan, Relentless | Permalink. I will soon be returning to the States for over two months but the schedule is packed! Below is a brief overview of where I’ll be and what I’ll be doing. The dates listed are fairly firm. However, opportunities for speaking at particular venues in those places are still being worked out. I hope that there will be an opportunity for me to meet as many of you as possible. If I’m going to be in your area and you would like to meet with me or host a gathering, please let me know. 16-29 Sacramento, CA attending a Sexual Assault Forensic Exam training for healthcare professionals presented by the California Clinical Forensic Medical Training Center, UC Davis. 4-10 Los Angeles area, meeting with community groups of Pacific Crossroads Church as well as meeting a number of other people involved in counter-trafficking efforts. I’m very much looking forward to seeing so many of you! Categories: expat life, Relentless | Tags: expat life, fund-raising, human trafficking, medical training, Relentless | Permalink. Where to start when writing about this event? I’ll start with gratitude. Thank you Jesus for seeing me through the organization of this event, for all the help you provided, for the beautiful weather (one can expect a least a little rain in July), for keeping us healthy and safe, and for the wonderful place to run. I also must thank MANY other people, but that would take up too much space on this blog. The whole thing would have flopped without everyone pitching in to help and support one another. Entire families were involved and I feel like we became more like family through the event. Beautiful. A timed event, where runners run around a fixed loop and count how many loops they can do within the given time frame, is easier to do than a distance race. For example, I only had one major aid station and an unattended water/electrolyte stop halfway around. Furthermore, more people could participate as I made different time divisions: 6, 12, and 24 hour plus a 3-hour kids division! A total of twenty-two people participated in the – some were brave enough to travel from other parts of Thailand to participate in this inaugural event. Most people started on Friday evening, but a group of women opted to start on Saturday morning. 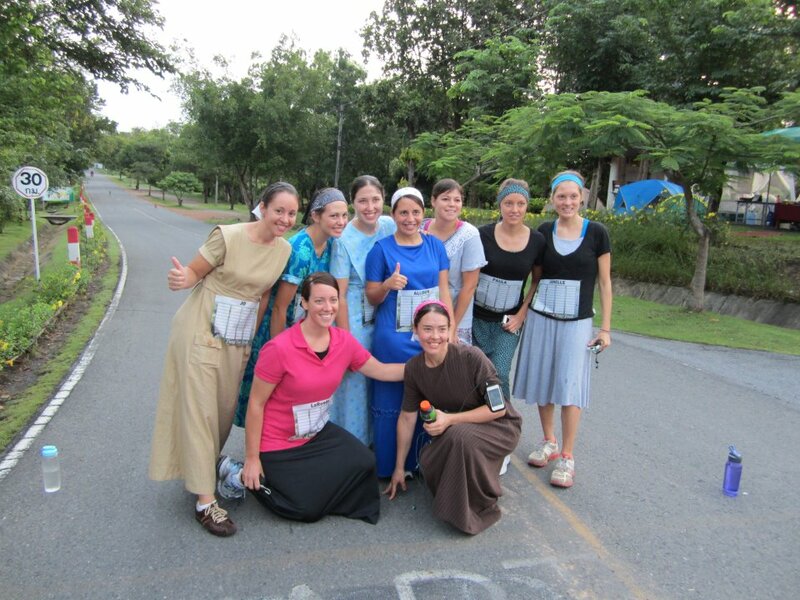 I was delightfully surprised to see that they were Mennonite! One does not normally associate ultra-endurance events with such groups of people, but they love sport and there are plenty of athletes among them! I love it when people break the mold, break stereotypes and go for it! The most common question people asked me was, “Do you sleep at all during the 24 hours?” I actually did not know the answer to that. I had never run at night before, let alone all night, and then continue through the next day. Normally, I am NOT a night person – sun goes to bed, I follow close behind – so I was surprised at how NOT sleepy I was through the night. I don’t know whether it was the constant physical activity or just being hyped up about the event, but I never had the urge to lie down and close my eyes. I did take some caffeine, but not nearly enough to account for the alertness. Amazingly, it didn’t rain as much as it could have as it is the middle of rainy season here. It rained early (about hours 2-3) and so I had to change from my regular shoes into my “miracle shoes” (the ones with 1400 miles on them – one of the kids named them) early on and ended up running most of the race in them. Faith ran in the 3-hour kids division, then stayed all night, and all the next day to crew the runners! She also ran extra laps as a pacer with runners to support them. 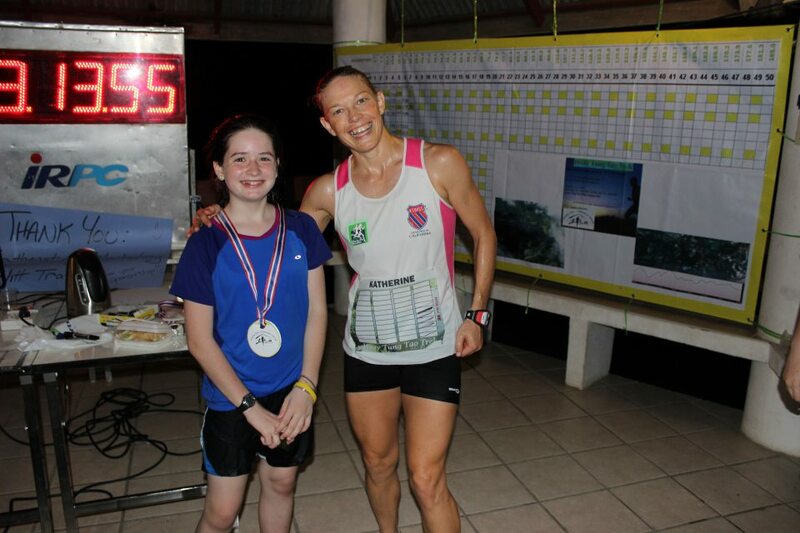 A budding ultramarathoner right here! She and her friend Adrianne were a jou I’m so proud of them! Except for changing my shoes and socks after the rain stopped I never sat down. I didn’t even stop except for the brief hiatus to grab a drink or a bite to eat through the aid station marking each lap. I also took some brief time outs to award medals to participants as they finished – the race director’s privilege! I suppose I could keep better track of what exactly I ate but generally it was a lot of watermelon, bananas, super-charged peanut butter balls, protein shake + coffee mix, Clif bars, and, the ultramarathoner’s surprise fuel: Coca-cola. I started my 37th loop at hour 18. Seemingly suddenly, the level of pain that one normally endures at that point in a race jumped a few notches and I was no longer able to run – at least with a decent gait. I decided it was finally time to take a break, perhaps 20 minutes? I could do that and still make 100 miles. However, as I sat down my friend immediately noticed my angry red and very swollen ankle. I took one look and knew I was done – no amount of will to finish could override what I knew as a doctor: I needed to stop immediately or perhaps risk greater damage. I was not disappointed (another surprise)! I had done well and I needed to live to run another day. Besides, 137km (85.1 miles) in 18+ hours is not too shabby, and this was just a practice run for my first 100 miler in September! Three of the 24 hour runners made it the full 24 hours and Brian cranked out 101 miles in just under the time! Ajarn Dee, a statistics professor, is in my Bible Study and she came out to cheer me! Although the event itself was not a fundraiser, I asked people to give towards my personal run and pledge a monetary amount per kilometer/mile run. Amazingly, I raised a total of $880 for my project Relentless! I did not have the strength training in my legs that is needed to sustain my legs for such a long distance. Partly because I had been rehabbing some tendinitis in my knee in the weeks prior. Strangely, the knee didn’t bother me at all (argh). I have a much better understanding of what it really takes to excel at such events, especially long distance road races, such as Badwater. I can “DNF^” with dignity and for good reason. 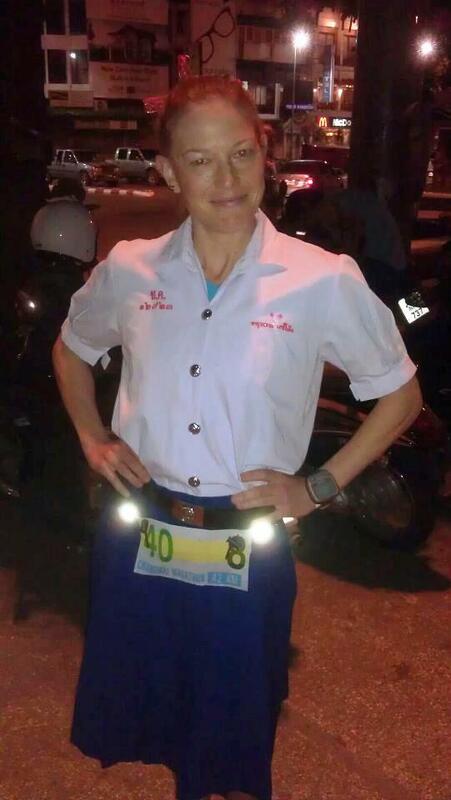 I learned a lot about race-directing in Thailand and look forward to next year’s event! I think everyone who participated or volunteered agrees that the event as a whole was a HUGE success and we are already planning one next year! Sunday brunch celebrating with good friends – runners and volunteers! Ryan, Richard, Ray, Heidi, Caleb, Henry, Ben, Faith, Adrianne, Karl, Ron, Connie, Sai, Jume, Rhea, Jung, Atsuyuki-san, Ajarn Dee, and all the other people who came out to cheer and help! You guys have NO IDEA how grateful I am for all your support and help in the prep and putting this on. Atsuyuki-san says it was the attitude of the people involved that made this one of the best races he has ever attended! For a slideshow of photos from the event, please visit this link. You can also visit the Facebook album. IF these links don’t work, please let me know! *cha-bu-duo: Mandarin for “close enough” and also the name of an annual 10k in Shenyang, China that I organized in past years. The 4th Annual run happens 1 September! Categories: adventure and sport, expat life, Thailand | Tags: Chiang Mai, Chiang Mai Ultrarunners Group, expat life, Relentless, running, Thailand, timed event, ultramarathon | Permalink. Dear friends – just a reminder that the Huay Tung Tao Trek 6/12/24 hour Endurance Run is just 10 days away! I’m making this an opportunity to raise funds for RELENTLESS by asking people to pledge a monetary amount per mile (or kilometer) that I run. More details can be found on this earlier post. Whether or not you donate, please do think of me and my friends as we push ourselves to the limit for a good cause! Categories: adventure and sport, Relentless, Thailand, trafficking | Tags: Chiang Mai Ultrarunners Group, expat life, fund-raising, Relentless, running, trafficking, ultramarathon | Permalink. Last week we had another clinic – this time with Urban Light in Chiang Mai. As my friend at Urban Light has beautifully written, it was “more than just a medical clinic”. I highly recommend that you click over to his blog to read what he had to say about the day. We saw 14 of the boys who regularly participate in the activities at the Urban Light center. The “clinic” was held at the center during the hours when the guys are normally hanging out, learning English, working or playing at the computer, etc. Some of the guys also participate in a baking class (at another site), learning kitchen basics, baking techniques, and other life skills. Categories: Relentless, Thailand | Tags: Chiang Mai, health care, Relentless, Thailand | Permalink.